Get started on the wall bed plan of your dreams. 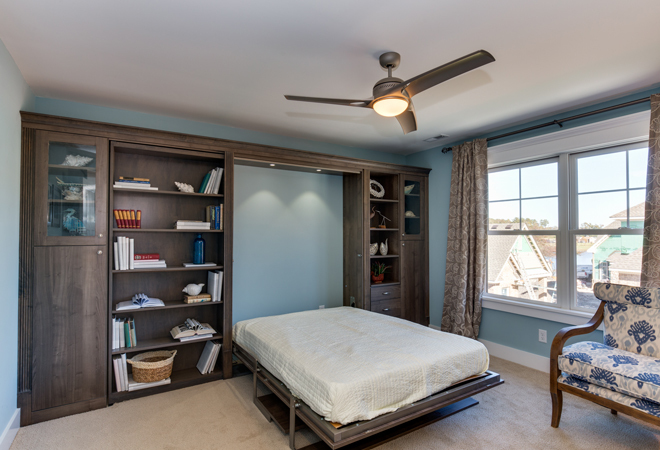 Add custom made cabinetry, drawers, doors, and shelving into your Murphy bed space and create countless ways to enjoy your space. 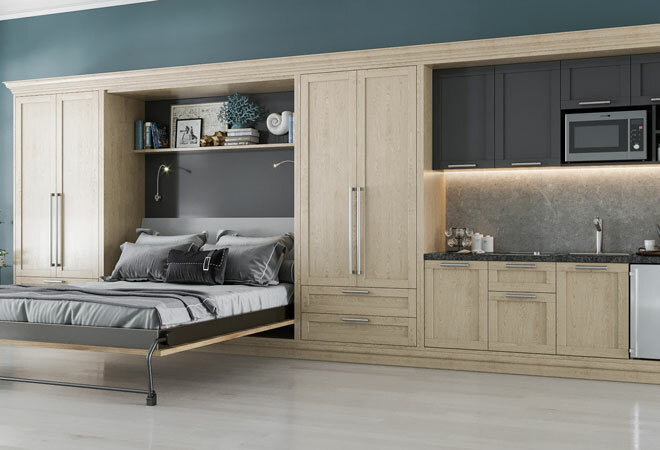 Whether you’re searching for ways to save space for your bed room, or seeking inspiration for a modern wall bed, it can often be difficult to picture exactly how the wall bed plan will look in your home. 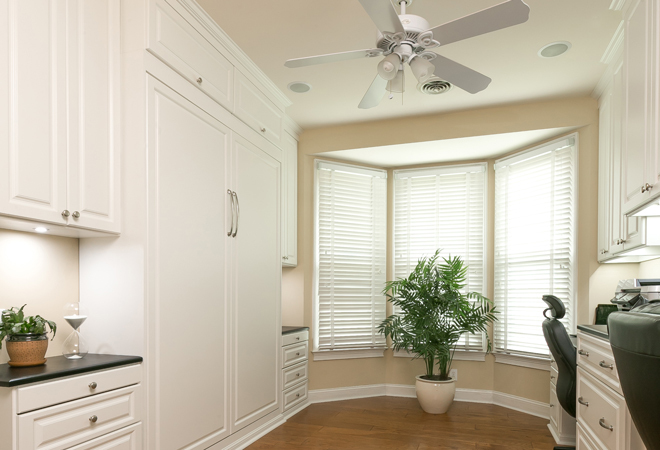 So, we have created a gallery with plenty of examples of custom built-in wall units to help inspire your vision. 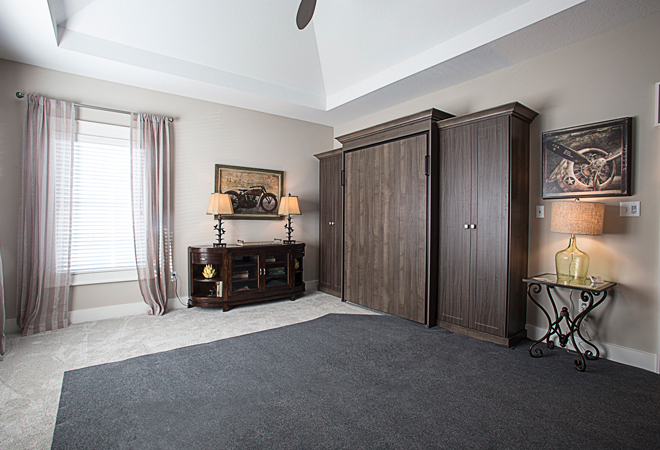 As you scroll through the photo gallery, keep in mind that we start every Murphy Bed design with a well-thought out plan that has been developed with your unique needs, style and budget in mind. Our designers’ collaborative process will allow you to take what you see here and modify it to suit your unique taste. If it’s simplicity you that you are seeking, then our simple bed enclosures will work well for you. 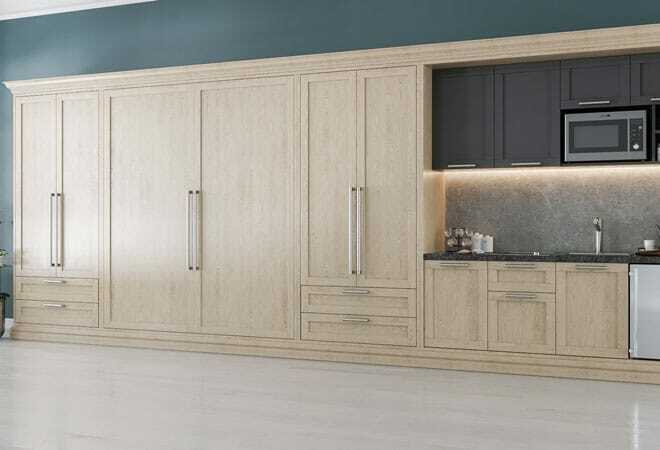 Conversely, if you’re envisioning an entire room of cabinets, then we will provide a solution that is functionally built to optimize your entire space while seamlessly blending with any existing décor. 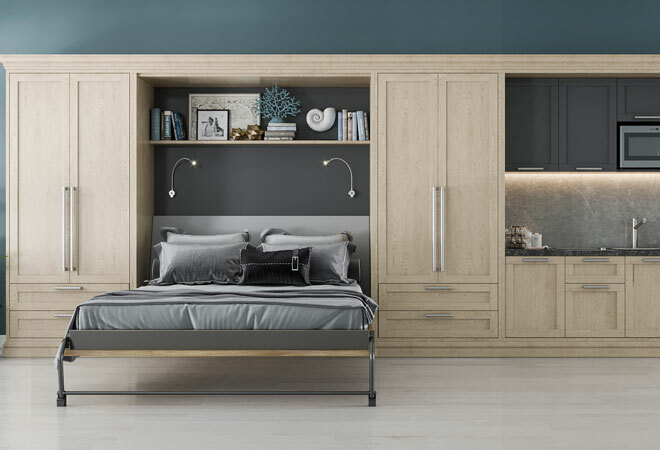 Our custom wall beds and cabinetry are always designed with functionality in mind, while seeking to expand the useable space and completely enhance the look of any room in your home. 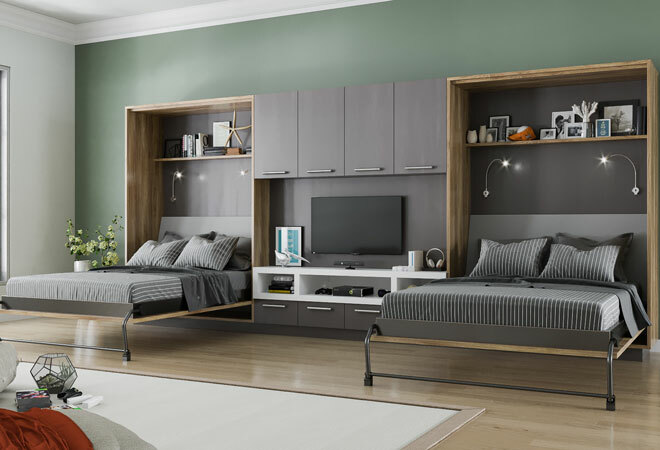 A wall bed setup that is perfect for the in-laws. 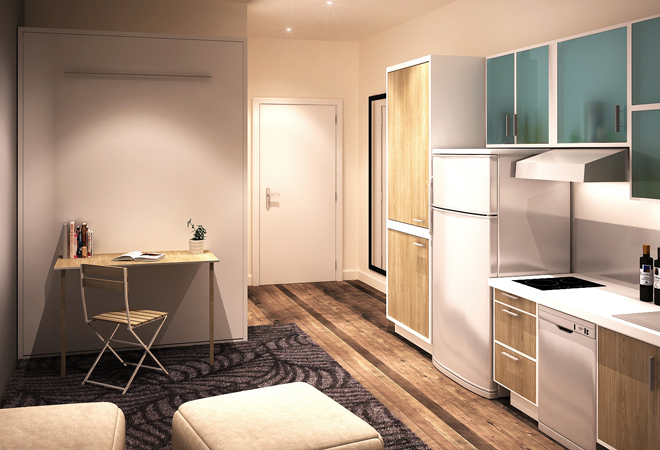 The small kitchenette has plenty of space for an extended stay. The maplewood Shaker style doors and drawer fronts contrast nicely with the charcoal painted uppers in the kitchen area. 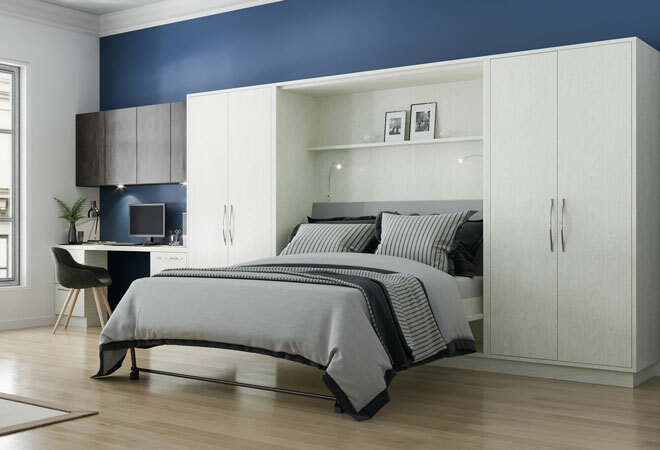 Large cabinets contain hanging and adjustable shelves while the generous sized bed makes a comfortable sleeping arrangement. 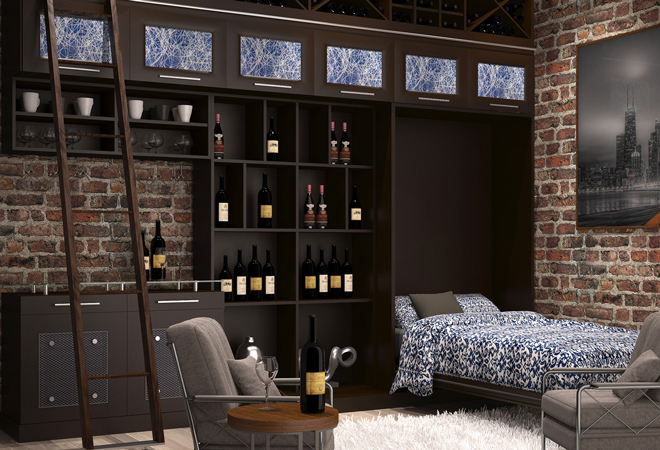 This wall bed arrangement is perfect for sleep-overs and extended guest visits. The double beds easily close leaving the floor space wide open for Wii gaming, exercise, and all the things your teens can get up to. The 3 color contrasting melamine create a striking unit. 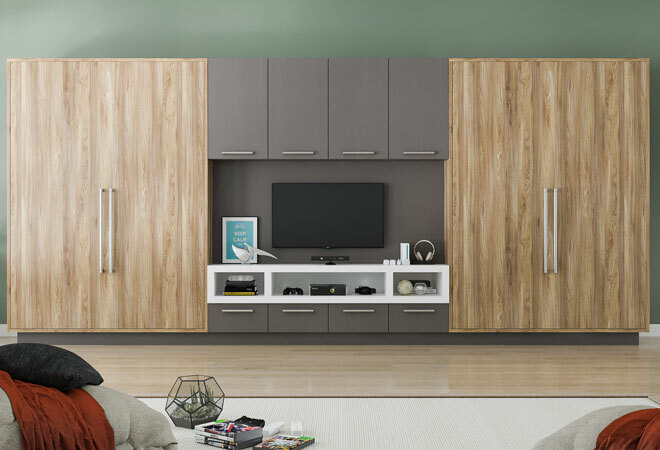 White and gray are neutral tones combined with an oak melamine to bring in warmth and together they create a sophisticated unit that adults will also feel at home in. The TV console area in the center allows for games and cable boxes. Plus there is a nice size counter for decorative items adding personality. If modern sophistication is what you’re searching for – we’ve got just the solution for your home office. 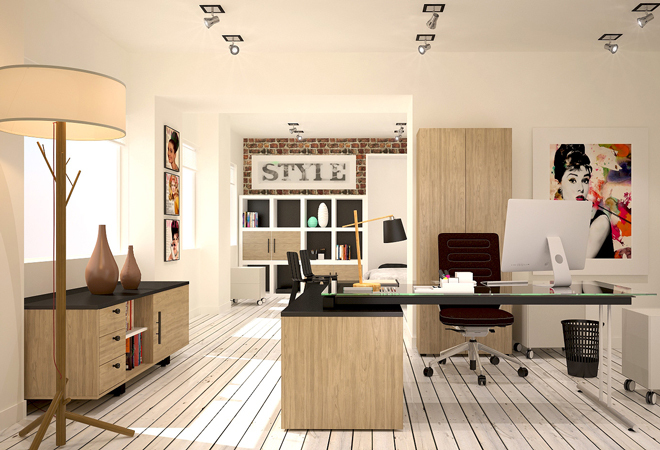 The urban design of your work space can be truly modernized with this layout constructed with a unique, engineered wood paneling from the Viva Tafisa line. 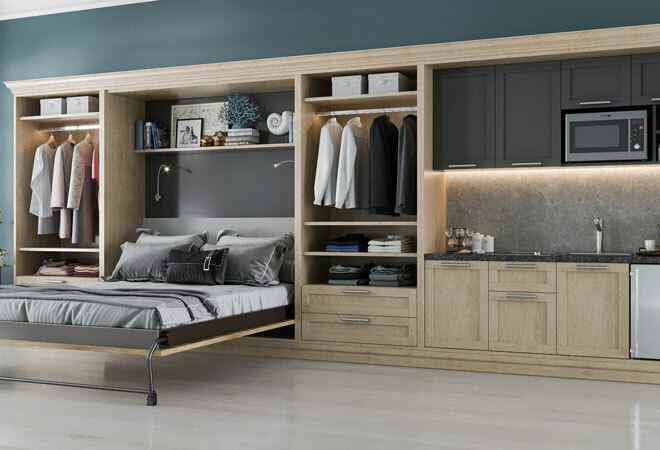 With thick shelves, side cabinets and closets for hanging and storage, you’ll have all the utilities you’d expect from any bedroom in the home. The Hafele bed comes with inset slab doors and recessed kick plate and unfolds nicely after long hours at your workstation. Gooseneck lamps have been added to make late night reading intimate and easy. Additionally, the materials in Winter Fun and After Hours keep this design sleek, but also light and breezy. Your office living space, in mixed materials, can make for a dynamic and multifaceted professional office. 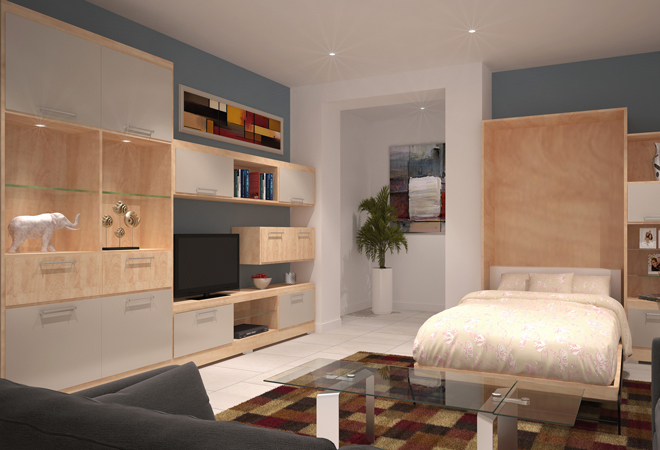 Adding a custom wall bed can transform it into a stunning bedroom. 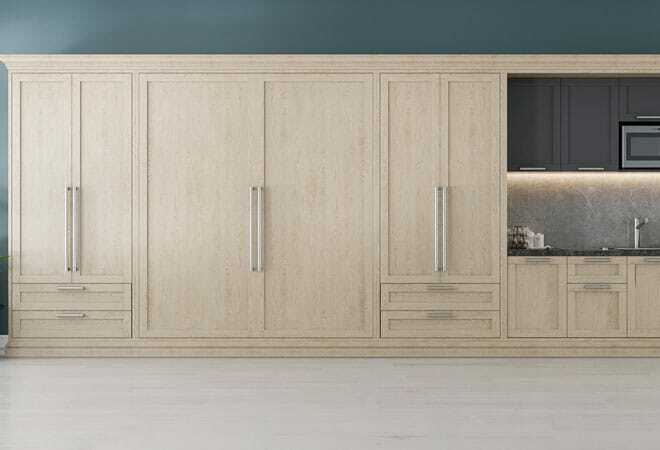 You can achieve both texture and contrast with your space-saving wall unit by combining inset doors and thick panels with elements like glass, black melamine, light wood grain melamine and white. Your space becomes truly multifunctional and cozy, yet sophisticated all at once. 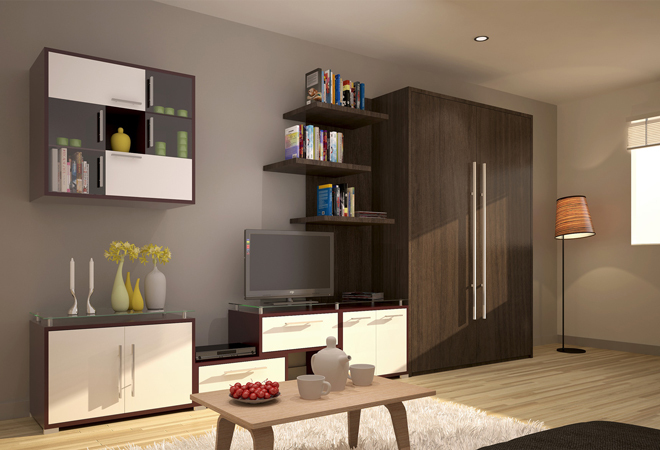 Why not create a sleek yet contrasting look and feel for your living room? 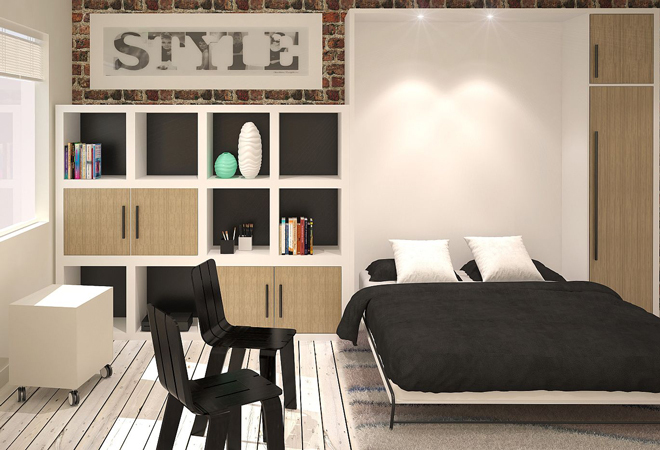 We can accomplish this by mixing Golden Oak veneer and White melamine giving your space a dynamic, yet textured vibe. 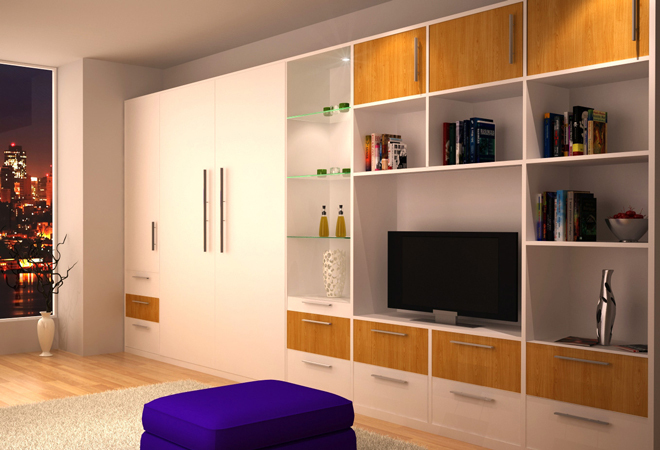 Over-sized chrome handles, glass shelves, cabinetry lights and simple lines complete the style of your living space. 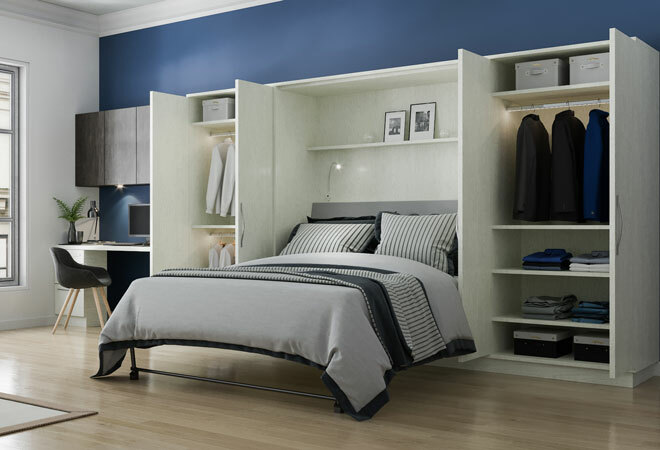 Completely multi-functional, a wall bed can be integrated into almost any unit. 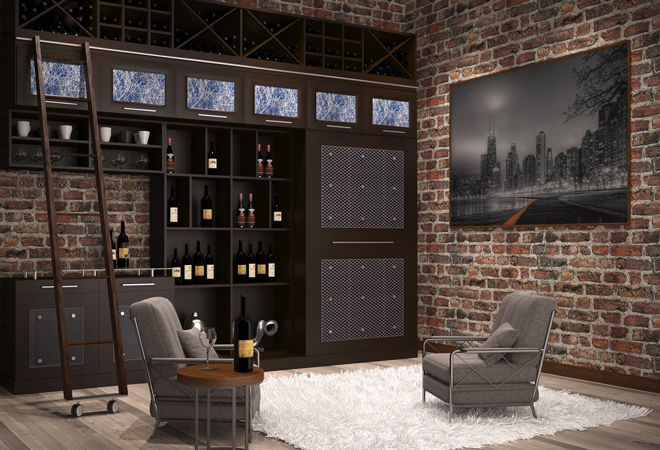 With a floating glass counter, stemware, wine racks, and decorative resins this wine bar adds old-world flair to this sleek, modern living space. 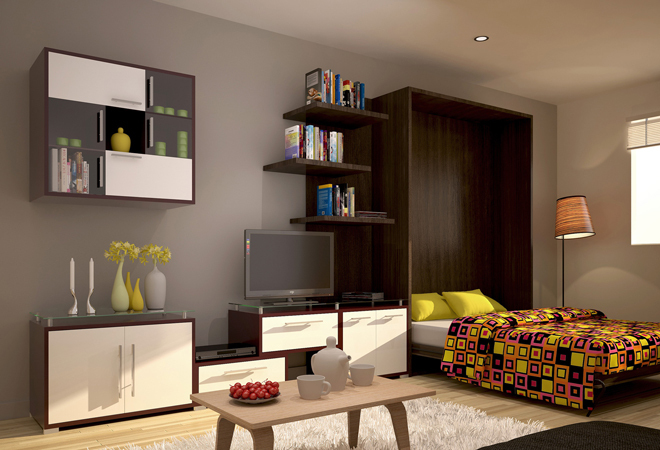 As you can see, the wall bed unit is also styled to resemble a cabinet instead of just a bed. 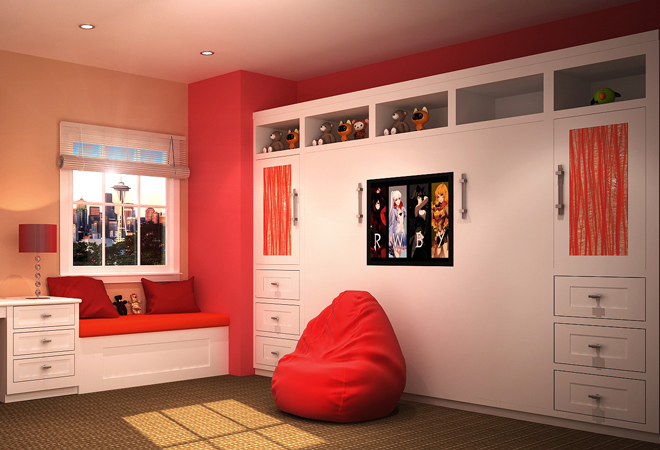 Kids like stimulation and this tween bedroom is the perfect setting for entertainment. 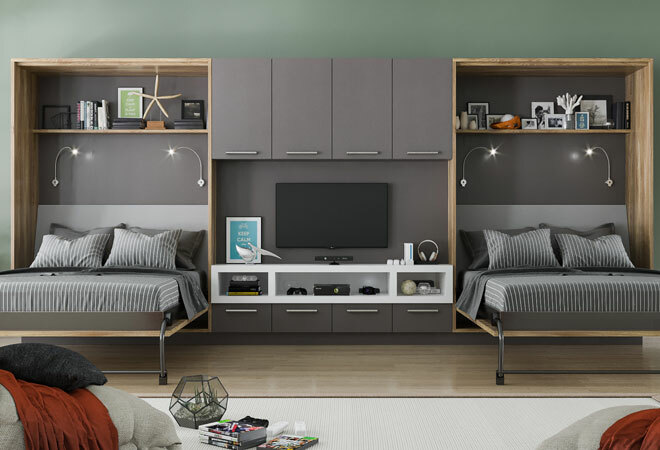 This unit features a Euro-style bunk wall bed that folds away to create a multi-functional space with plenty of room for fun activities. We can provide a guardrail for younger kids to keep the sleeping unit safe from tossing and turning at night. 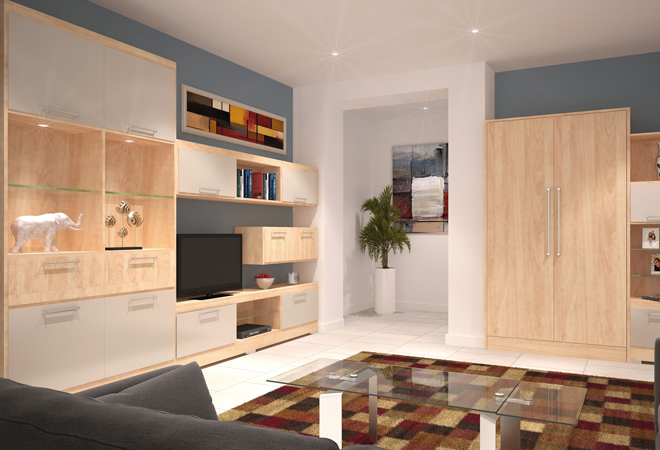 We have just the right solutions for more compact living spaces. 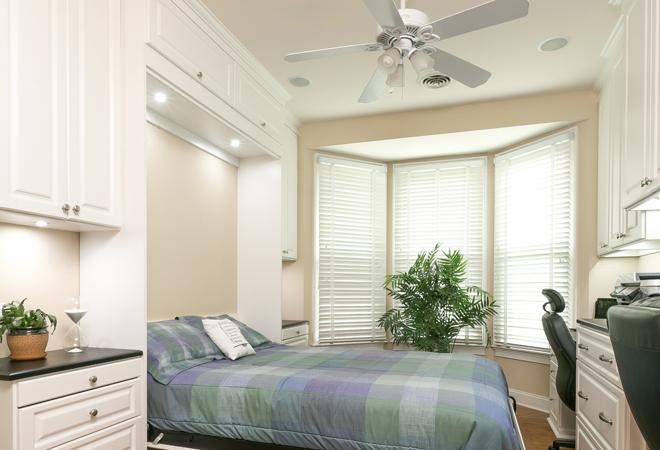 As you can see, this stylish and functional Murphy bed fits neatly into this small space keeping it light and airy. 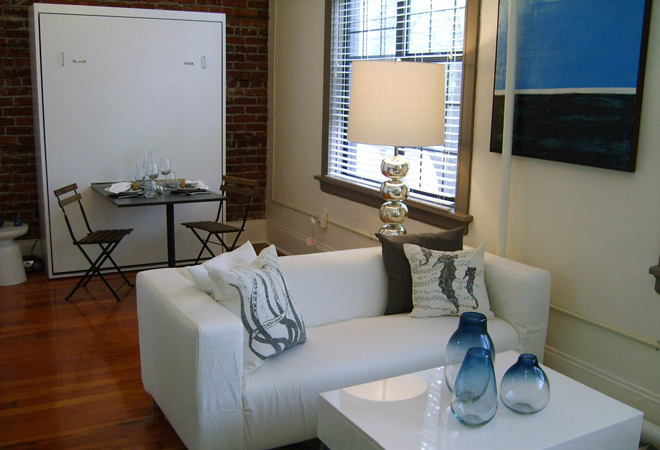 The 1” white melamine creates a classic and ideal look for an urban dwelling. We have a variety of options for your wall bed unit. 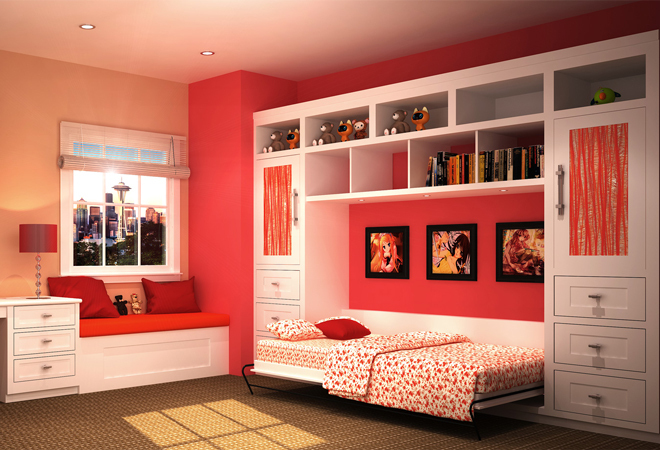 For example, this teen room features a side-fold wall bed, a window seat and a desk in white painted MDF. 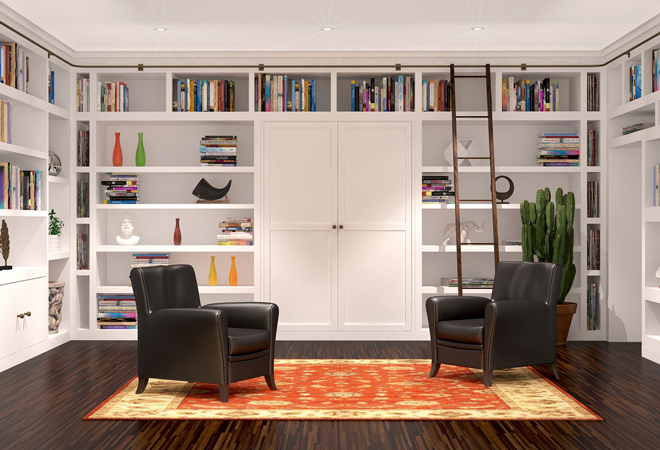 The panels and shelving here are extra thick 1 ½” – 2 ¼” flat edge which creates a bold yet modern look. 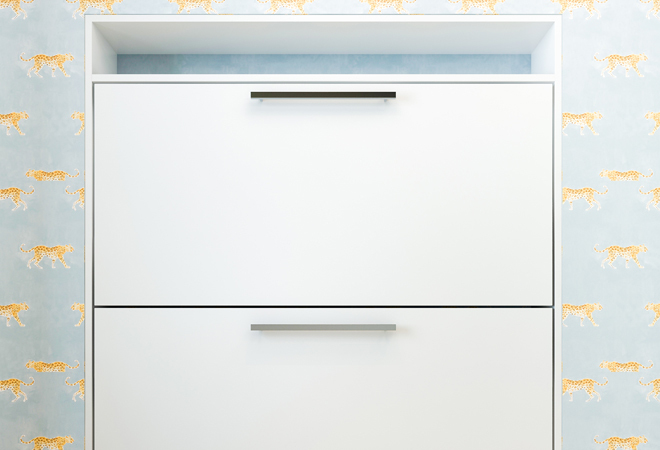 The Lumicor Lipstick resign inserts and flat framed doors add color, while the doors and drawers are inset, which shows off the 1 ½” shelves and frames. The wall color is highlighted by adding flat molding finishes to the top while the backing is left open. The finished look is stylish and festive. 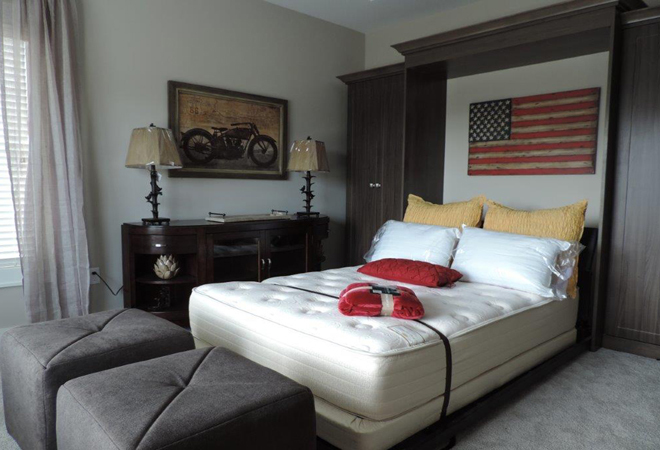 These days wall beds come in some many options it can be hard to narrow your design selections down. 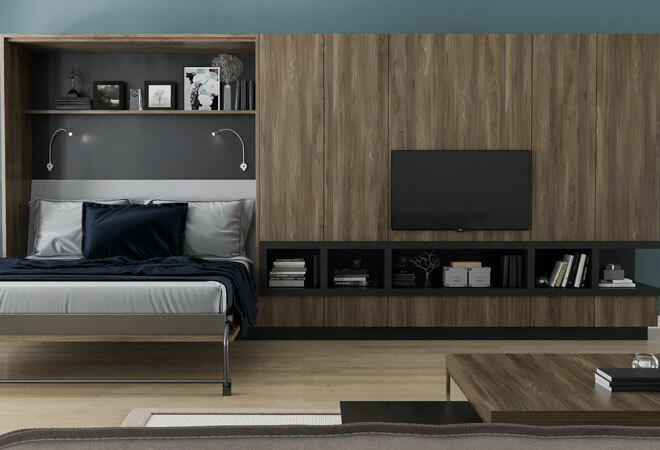 This modern and very elegant entertainment area is integrated into the loft wall bed system. Lines are clean and dramatic with the inserted thick framed minimal open shelving area below the the floating television. It creates a centerpiece while blending in at the same time. The material is synthetic wood with heavy grain accenting the contemporary modern style while the color brings warmth to the overall space. 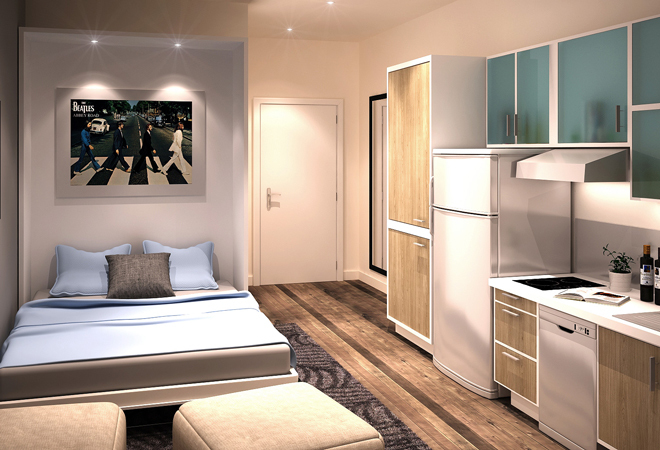 Lofts are limited in storage and this design helps to provide the lacking space with plenty of hidden closet space behind the slab style fronts. Just picture this look in your home. This luxurious wall unit was designed with painted MDF shelves in varying degrees of thickness. 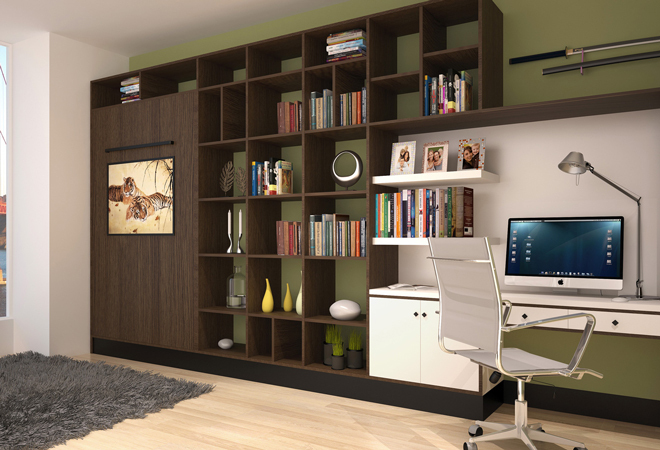 It creates the perfect aesthetic for storing your books, decorative keepsakes and memorabilia. 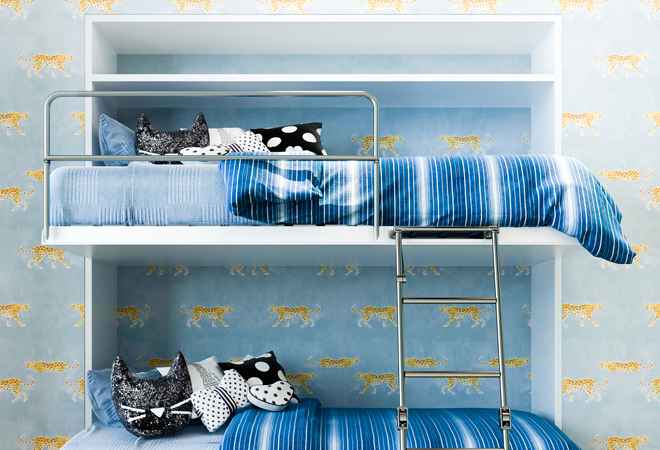 The ladder is functional and allows the room to be utilized at its fullest potential while the space-saving wall bed is this room’s intricate little secret as it appears to be a storage cabinet when not in use. The final result is a stunning library with a cleverly hidden living space. 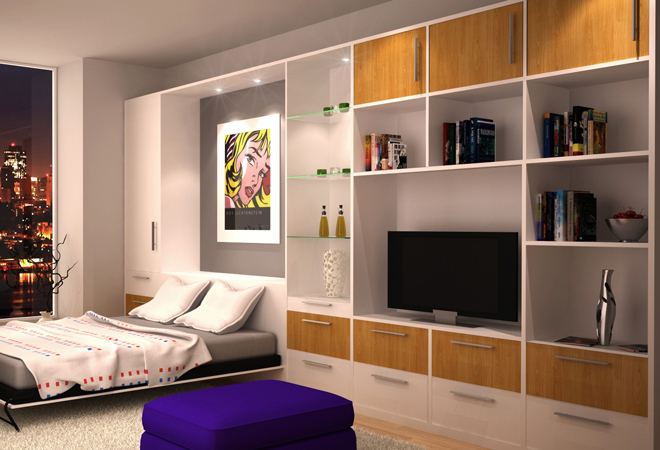 A Murphy wall bed is the ideal solution for maximizing your studio apartment or condo. Not only does it add a modern flair, but the addition of floating glass counters and shelving make this wall unit practical and playful. The added touch of the Chocolate Pear Tree and Almond melamine keeps the unit light and airy. 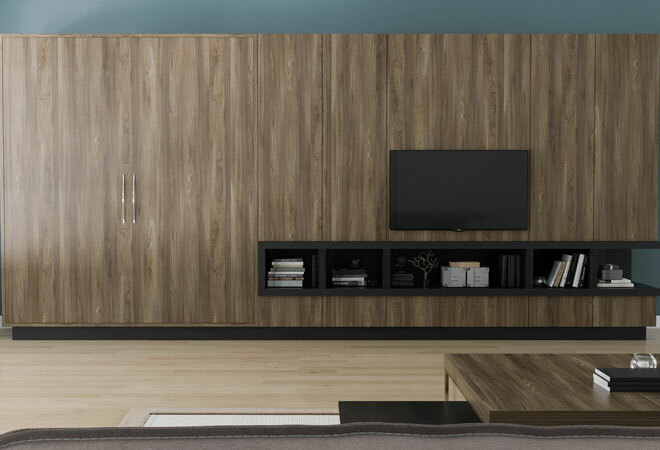 This beautiful Secret and Almond melamine create a stunning look for both the Murphy wall bed and entertainment center. 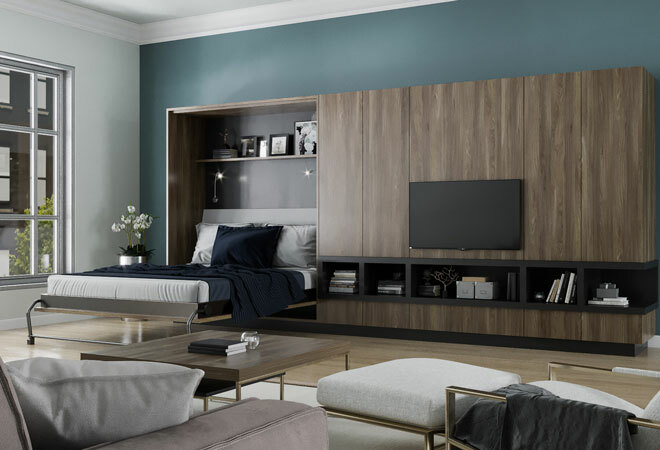 Adding Secret backing to the unit, along with the blue-grey color on the walls creates a look that is both modern and dynamic. The extra modern touch lies in the continuous base with brushed chrome feet, glass shelving, over-sized handles and cabinetry lighting. Whether your style is more modern or a bit more eccentric, we have just the option for you. 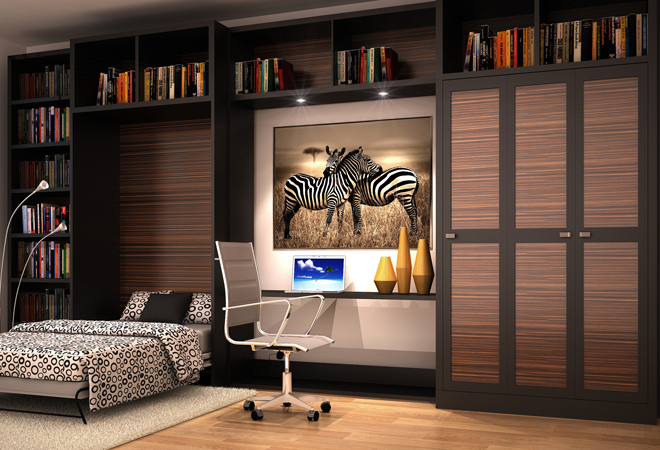 To design a wall bed system with extra flair, add Zebra wood inserts to the wardrobe cabinets that are also completed with framed Black melamine. Need to multitask? 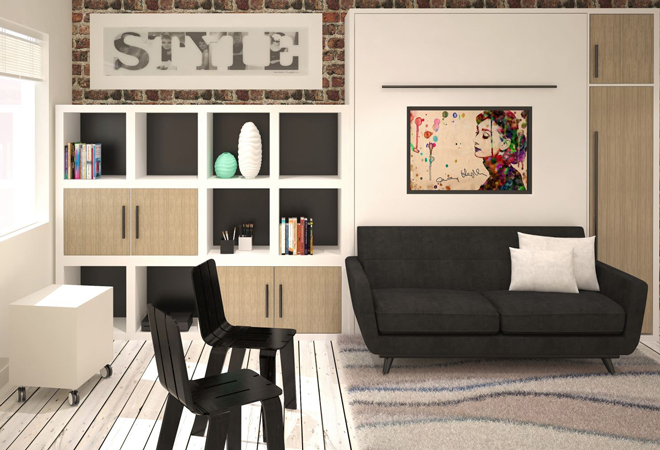 Add a writing surface with a masculine touch with 1 1/2’” panels and shelves, and now your space is eclectic, multifaceted and multifunctional. 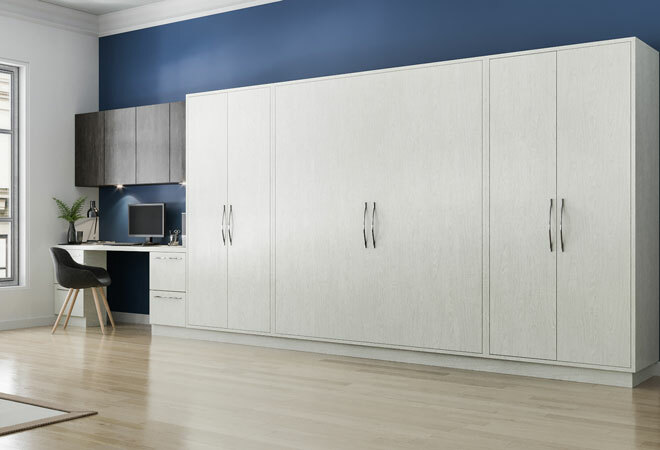 Transform your living space into a flex room with Woodgrain melamine cabinetry that has a large workspace when the bed is folded. Now your built-in desk can be used as a computer desk, craft station or workbench. 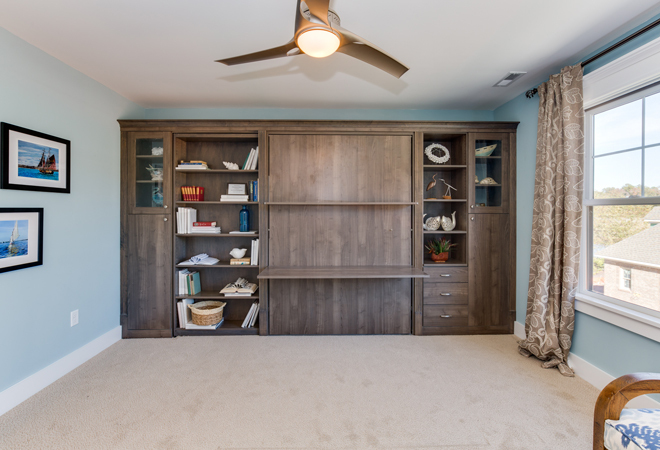 The beauty of this unit lies in the fact that the bed is perfectly framed with flute and features large storage shelves for books, decorative items, and memorabilia. Add more flex to space by utilizing the hidden storage space behind an area of the shelving swings. This wall unit is truly a hidden gem. 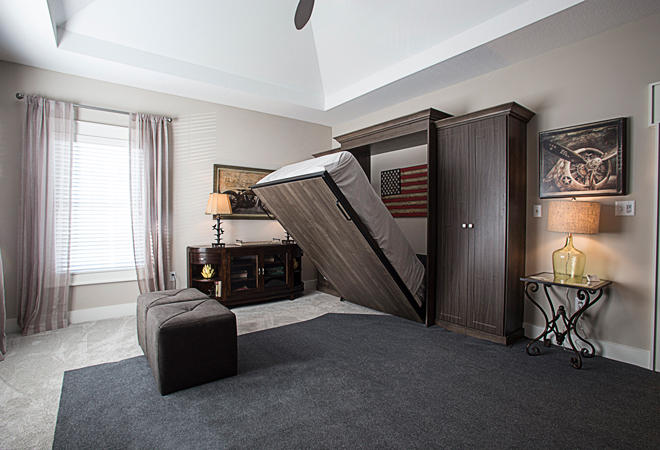 Your Murphy bed provides the perfect space to utilize when working from home, creating the ideal office space for long hours and creativity. However, when work goes a little later in the evening this wall unit folds down, creating the perfect little resting space. This is ideal for working unconventional hours when you don’t want to disturb your partner’s sleep. It’s also an ideal set up as a guest space for in-laws or family friends. 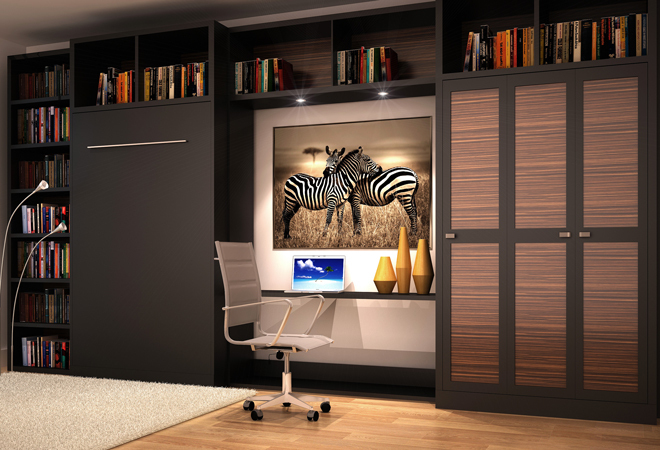 Easily transform any area of your home into an office space with this Murphy bed unit. 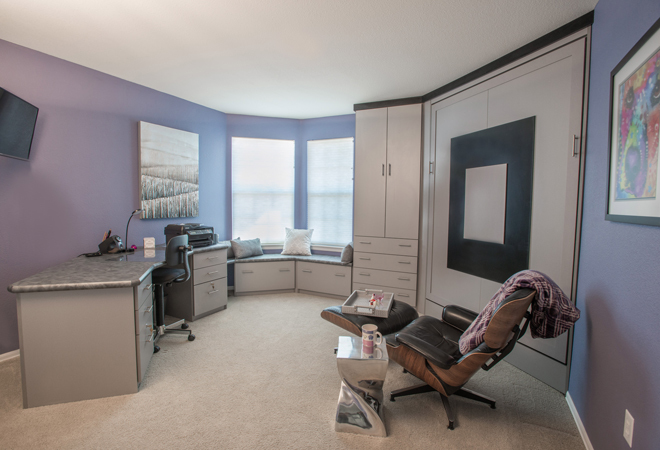 This guest room features an upscale finish but is completely affordable, and also easily doubles as an office during the day, giving new meaning to the term home office. 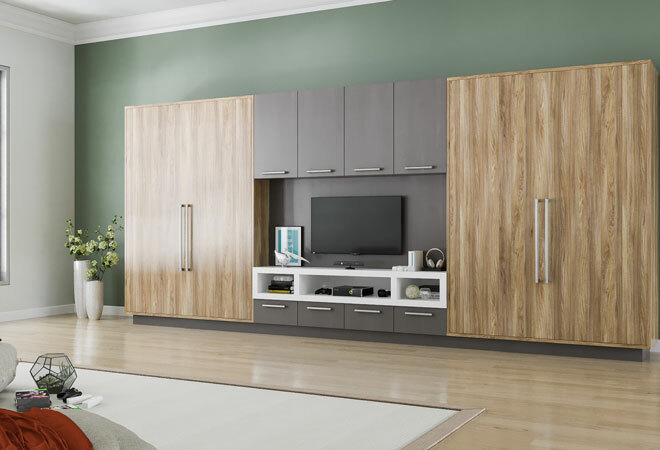 This wall unit is designed with beautiful white melamine and finished with decorative doors, drawers, panels and molding. 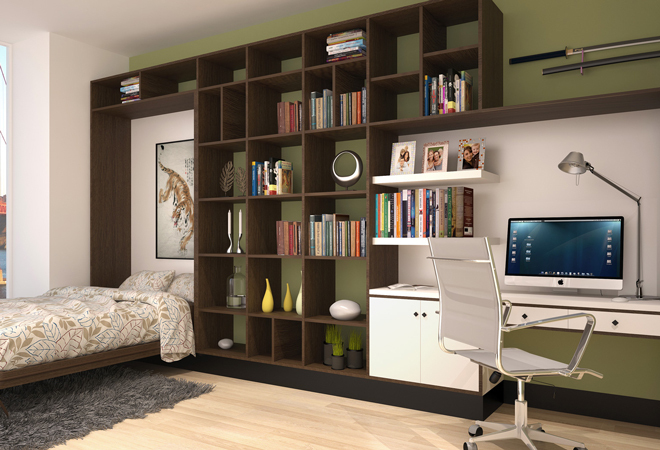 This is the perfect way to optimize space with built-in drawers, a workstation and a wall bed. Our collaborative design process allows us to combine your unique tastes with functionality and creative design. As an example, the mixed materials highlight this workstation meant for everyday use, as well as the functional wall bed. Using the contrasting green wall as backing for the unit adds a pop of color to the Chocolate Apple and White melamine for an Asian-inspired finish. 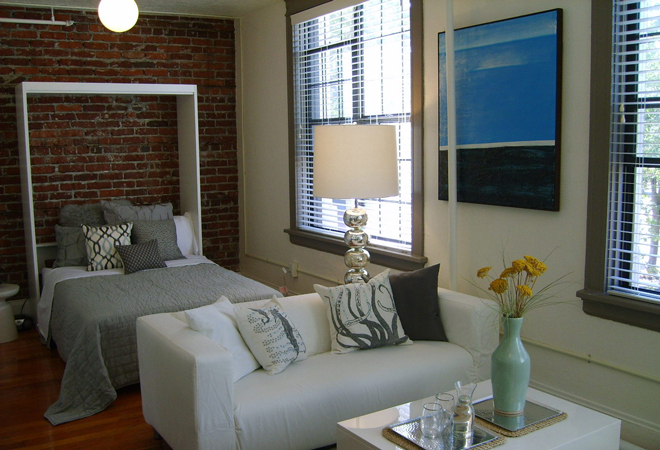 This micro space, located in Portland, OR, is a great example of how a Murphy bed can help transform a small space into a more spacious living area. On the front side of the bed panel is a built-in workstation that folds down and is perfect as a work bench, computer station or design area. 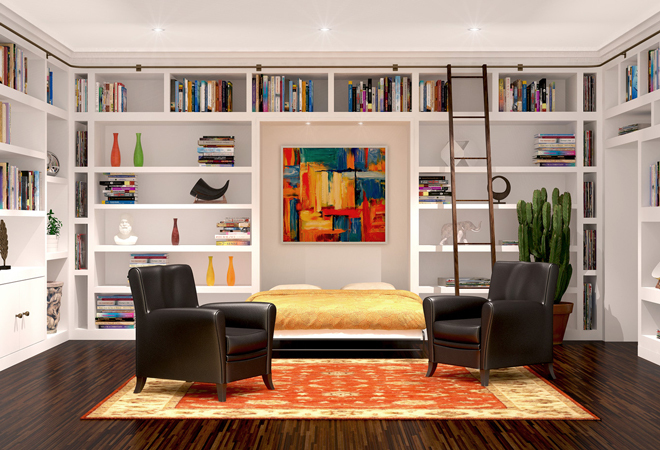 Murphy beds help transform any space into a stylish and multifunctional living area. 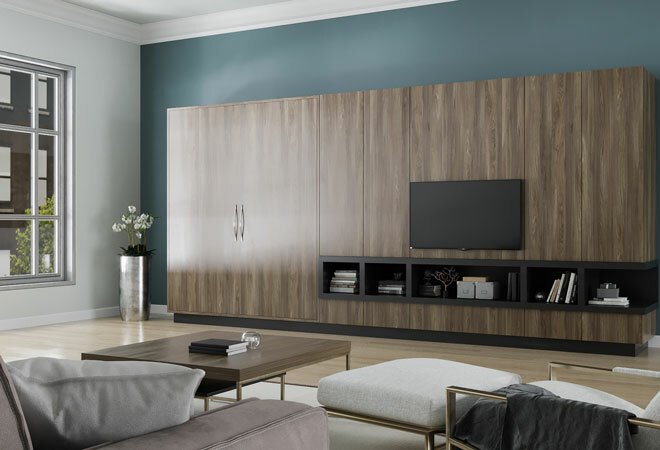 With a built-in design that matches the furniture in the room, a custom wall unit provides the perfect guest space when friends or family stay overnight. 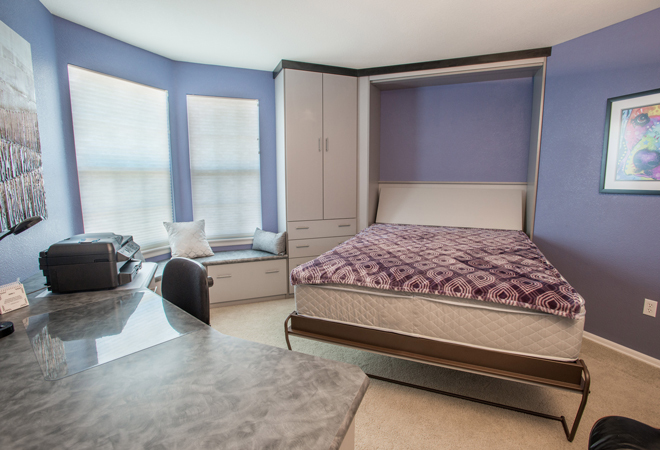 When your guests leave, simply lift the bed to convert the space into a work out area or meditation room.